Got up early for breakfast considering the rather late night. I was down there at 8.30 local time as I was to expect an interview with Santander Bank. At 8.15 UK time. This is bizarre I know; being down the road from Santander’s HQ over here whilst the British version calls me here in Spain! Breakfast was lovely – a large bowl of watermelon, kiwi fruit, pineapple, orange and grapefruit. Followed by a plate of eggs and traditional sausage – very naughty, I know, but I couldn’t resist. All washed down with a mint tea. I was doing my early morning trumpet routine in the hotel room whilst pondering what to do with my free morning and early afternoon. So, I decided the quickest way to see around the city, whilst doing myself some good was to go for a run. It was a bit warm but a gentle breeze was blowing. I set off alongside the Rio Urumea and headed North along the side. The river water is so clear; there are schools of fish everywhere. It is like looking into an aquarium. I progressed past several bridges and skirted around the old town. I headed farther, and passed some RLPO members ambling and Kate Marsden running in the opposite direction. 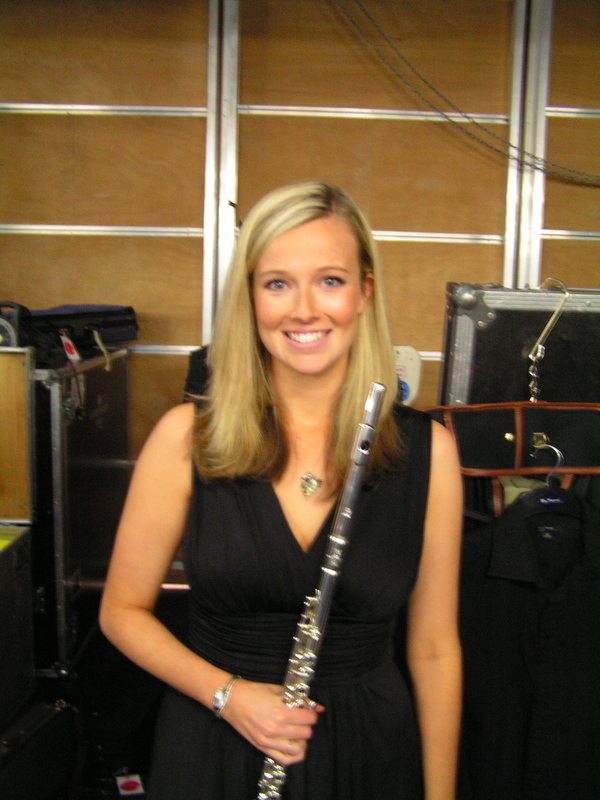 Kate plays in the second violins and is getting married on her return from this trip. The hen party is apparently on Saturday, in La Coruna. I don’t know if I should be around to blog about it or not. I think not. Kate also plays for the Philharmonic football team. 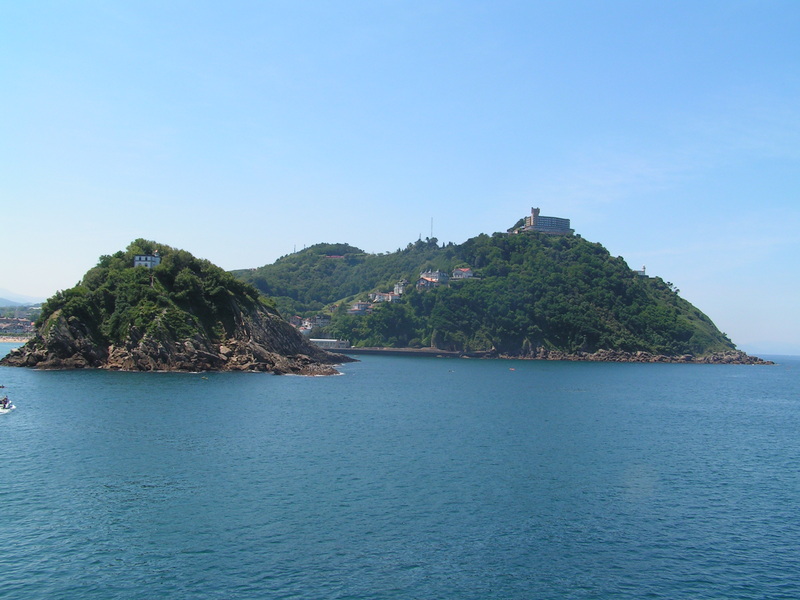 I progressed further round until I reached the sea and the walled fortress on the point known as the Monte Urgall mendia. Right round, passing a quirky little fairground. 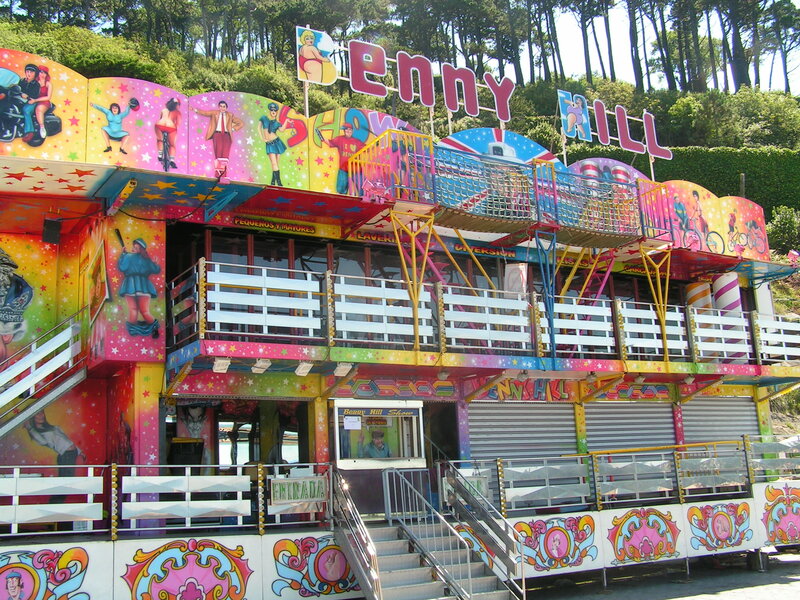 As I ran passed, I was rather amused to see that one of the attractions was a Benny Hill house of laughter/fun. Benny Hill – we are not worthy! Actually, when I started my job in Malaga, the management housed me with a viola player from Shanghai, called Li Hong Chuan. He spoke no English and I had no Spanish; the only thing we could understand together on the television was Benny Hill. 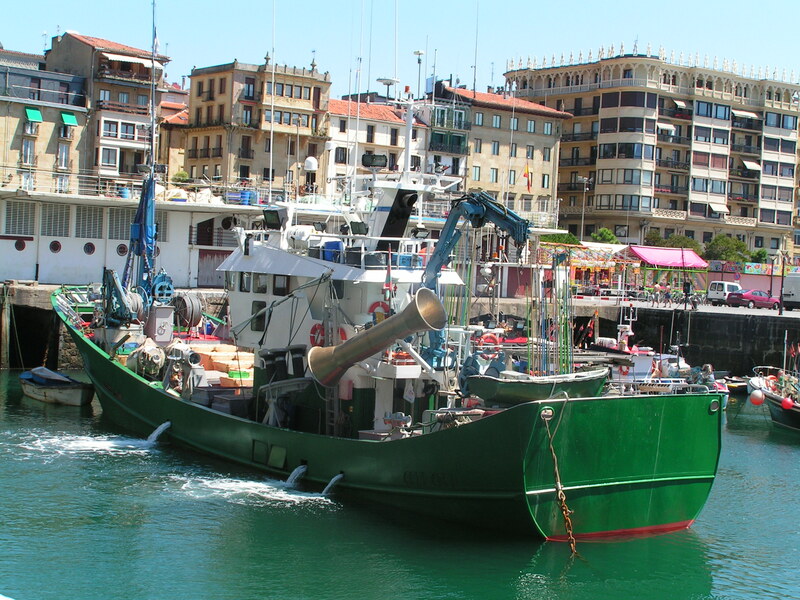 There is a water sports area, fishing harbour, marina and two beautiful beaches, the Playa de La Concha and the Playa de Ondarreta. The sky is a clear blue. The scenery is wonderful and the old town very beautiful. Even the modern interjections seem to fit in well. I progressed along further alongside the Amara Viejo and back to the hotel. This is heaven. Liverpool, I miss you! So now for a little more practice in the hotel room and then a cycle ride round to further parts of the city before the rehearsal at 3.30pm for tonight’s concert. And some photos I think. Lunch of course; More Pintxos and tapas. This is what I see the locals eating in the old part of town, so that is good enough for me. The bike is only five euros per day from the hotel and there are purpose made cycle paths alongside all the roads and beaches. 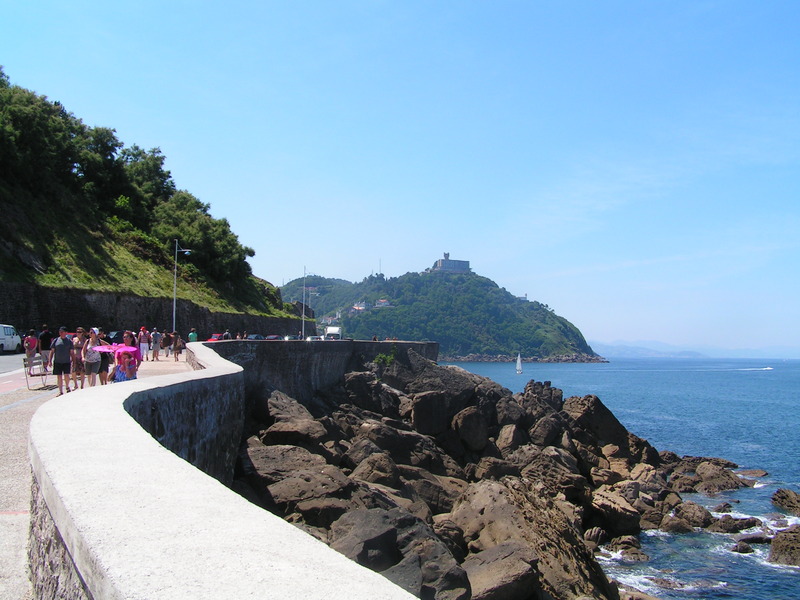 You can get round the whole of San Sebastian pretty quickly like this. 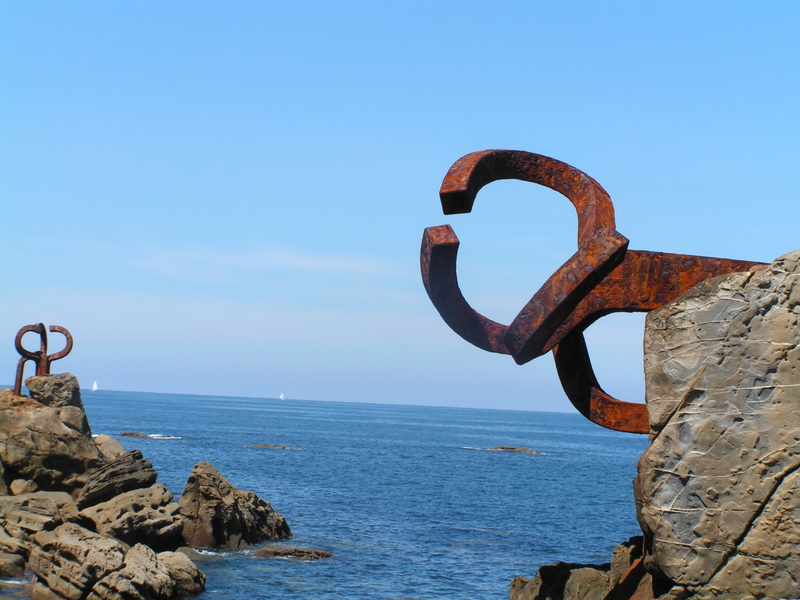 I cycled right round to the far end of the Playa de La Conchas [the beach of shells to see a famous piece of sculpture by Eduardo Chillada, called ‘Le Peigne du Vent’, or the wind comb. 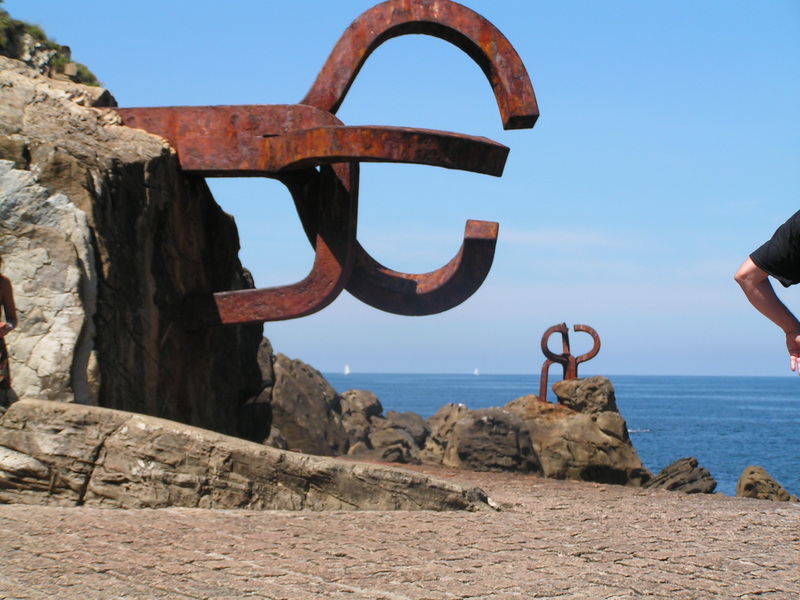 In such an idyllic place as San Sebastian, it is easy to just ramble on about how beautiful it is. Indeed it is heavenly – I am almost forgetting why I am here. WORK! 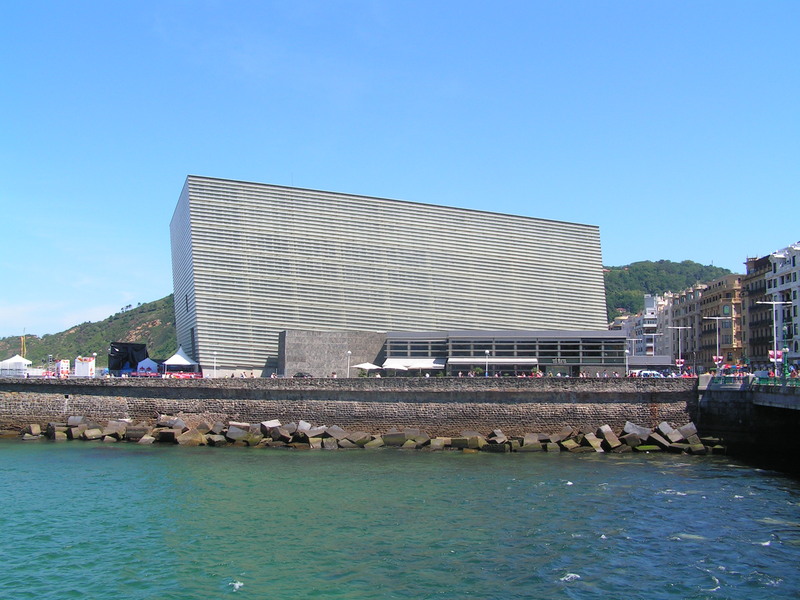 The ‘Kursaal’ concert venue and conference centre is a modern building right on the sea front. It is a very interesting design; sort of a juxtaposition of new against the old. Tastefully done though. The rehearsal was delayed as Vasily’s flight was delayed, but we got down to business. Vasily explained to the orchestra that the concert organisers asked him why we were playing such an ‘unknown’ piece of repertoire as Cockaigne by Elgar. Apparently it has never been played here before. Well, that’s as good a reason as any in my book. We top and tailed that work but rehearsed Sofia Gubaidalina’s ‘Under The Sign of Scorpio’ in more detail. Gubaidalina was in attendance to lend her visions of the work to the rehearsal. 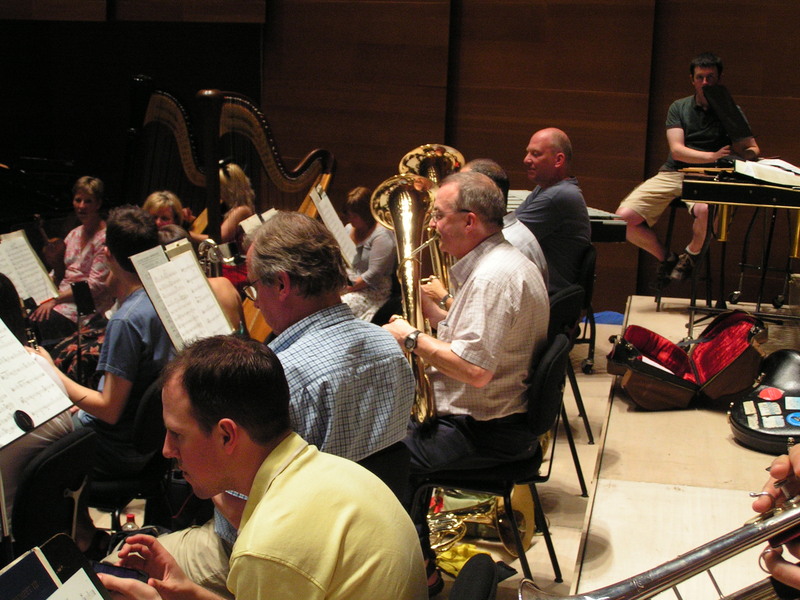 The work is modern, a piece for Accordion and large orchestra. The percussion section alone spanning the whole width of this large stage. The horn section also doubling Wagner tubas. It is a set of variations based on six hexachords. The writing allows soloist Inaki Alberdi to explore so many moods and changes of style. I like the piece, we shall see later what the audience think. Some more detailed work on Shostakovitch Symphony No. Five – Vasily honing the RLPO to perfection to get the best out of a new accoustic to suit our award winning collaboration with him. 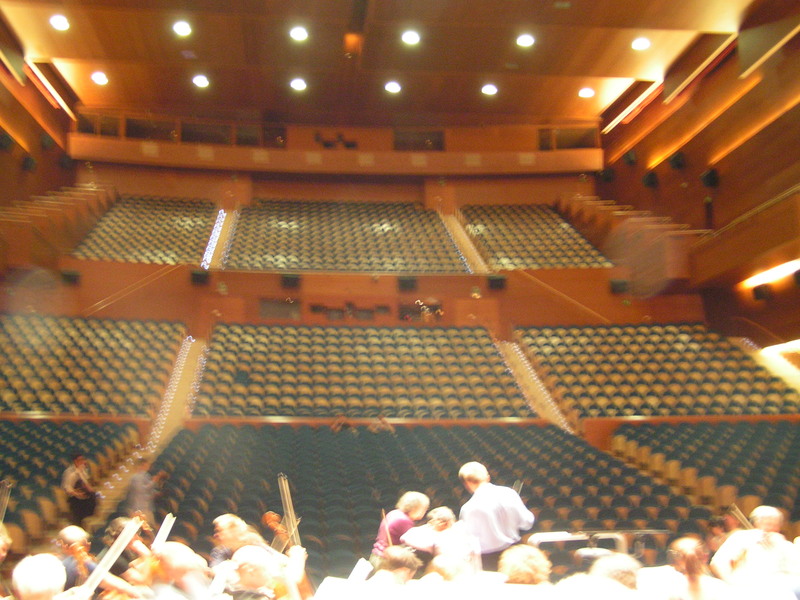 The Hall looks huge from the stage but I feel we settled into the accoustic very quickly. I had to cycle back to the hotel after the rehearsal as Rhys Owens had forgotten his reading glasses. I had forgotten a particular mute for the Gubaidalina also. I took the time to just rest out of the sun for a while as I am getting very red now! 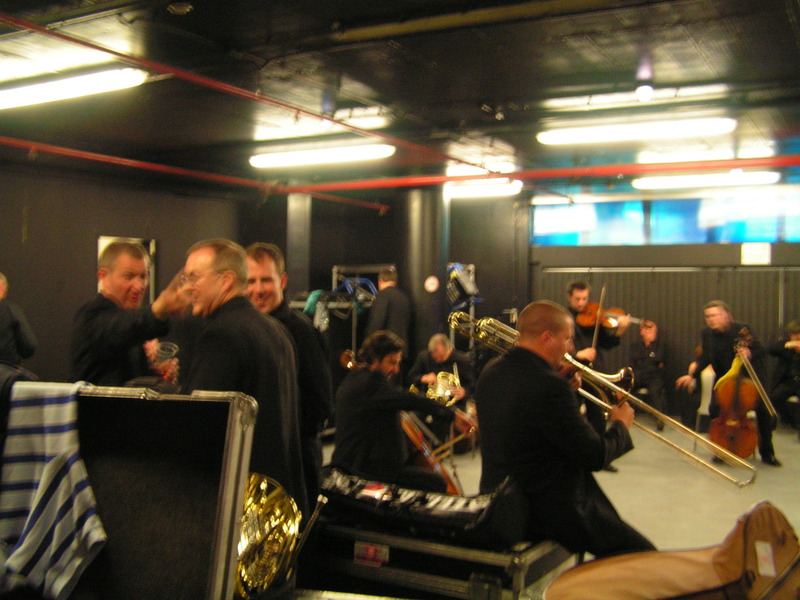 It is always nice to have a bit of a rest before a concert too. It seems as though I have been doing this blog for ages and yet this will only be our first concert of the tour. Anyway, little light tapas for preconcert dinner will set me up nicely and now to the hall to get changed and do a spot of last minute practice. The concert was very successful. Despite concern expressed earlier, the audience appeared to take to the Elagar, shouting ‘Bravo’ etc the moment it thad finished. Likewise with the Gubaidulina. The applause displayed for the composer’s bow showed how much affection there is for Sofia Gubaidalina in Spain. Vasily wowed the audience with his reading of the Shostakovitch and the RLPO were delighted with the audience response at the end of the concert. I particularly enjoyed the playing of Tim Brown, 1st horn in the difficult lonely passage in the first movement. My favourite moment of the piece is the haunting, woeful oboe solo in the slow movement, played immaculately by Jonathan Small. The audience were treated with the Russian Dance ‘Trepak’ from the second act of the Nutcracker as an encore. Mick Hucknall was in the audience too, from Simply Red. Outside and in the Old Town the local populace were carrying on the celebrations for ‘Big Week’ in a similar manner to the previous evening. Such good fun. Well, it’s an early bed tonight for this ‘blogger’. All this tourism has taken it’s toll.